AVALON ― William Richardson Hill, a resident of Catalina Island for 55 years and owner of the Old Turner Inn Bed and Breakfast since 1989, passed away recently at the age of 99. Born on August 7, 1917 in Pasadena, Hill grew up spending his summers on Catalina Island where his grandfather built three houses. Hill ended up taking permanent residence on the island in 1962. Hill would reminisce about fishing on a small skiff as a young boy and catching 100 pounds of fish, according to his daughter Kathleen Hill Carlisle, making $2 per day compared to a friend bagging groceries at $2 per week. Having obtained a captain’s license, Hill drove shoreboats at the Isthmus and Avalon right after World War II. He also ran a fishing charter business on Catalina Island at one time. Hill loved boating and fishing. However, he did not like eating fish. He would return to his home with fresh catch in which his wife and children would clean, cook and eat while he would enjoy a burger. 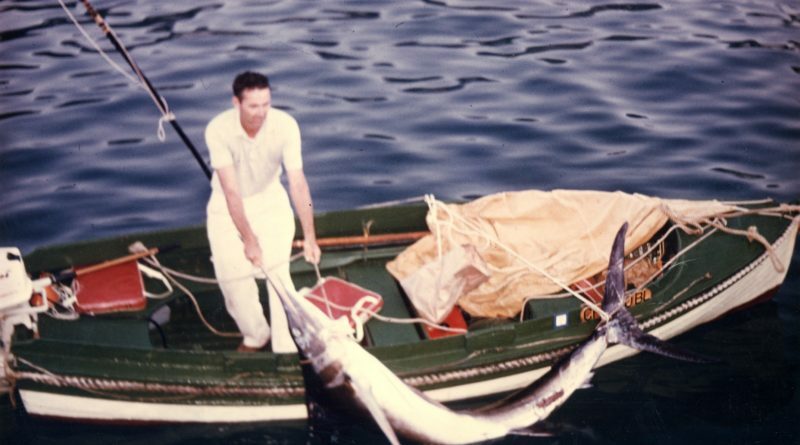 In 1964, Hill caught a 198-pound marlin offshore with a boat too small to fit the fish in it. He ended up tying the fish to the side of the boat to bring the fish to shore. His last fishing trip was in Cabo at the age of 97. He was aboard Baja Cantina, a boat owned by family friends, for 12 hours and reeled in a Wahoo on his own. A dedicated reader of The Log, Hill would take stacks of the paper and distribute them to local businesses, residences and even Airport-in-the-Sky for the pilots to read. “He did love The Log and was the unofficial paperboy,” Carlisle commented. A place other than the water in which Hill had a great fondness for was the ballroom. “There is nothing like that in the world to be dancing up there in that ballroom,” he would say to his family and friends. Those living on the island and frequent visitors of the island knew him and his love for dancing. He was often seen dancing with young ladies. After Hill’s 100th New Year’s Eve celebration where he spent the evening dancing, he ended up catching a cold and never fully recovered. His life was full of adventures. He often shared his stories of “the early days” with family, friends and guests of the bed and breakfast. Hill appreciated island-living – the uniqueness of Catalina Island and all the fresh air that surrounded it – believing the clean air contributed to his long life, according Carlisle. A celebration of life is being planned in his honor in Avalon for early August.